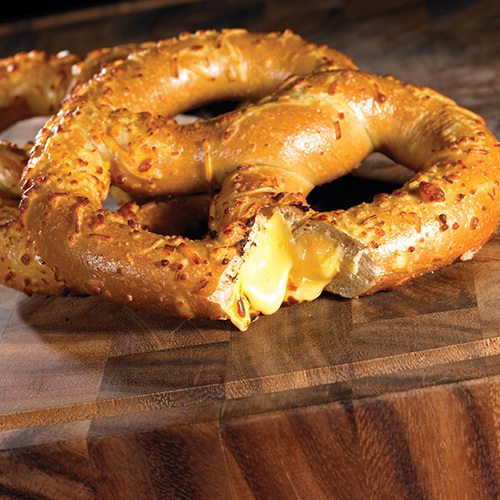 10 All-American pretzels filled with delicious real cheddar cheese & topped with more freshly shredded cheddar cheese. 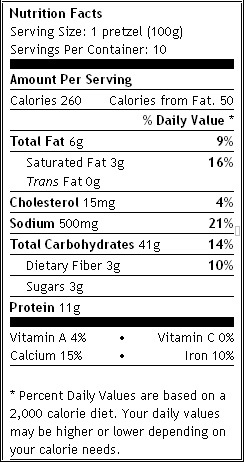 Wheat flour, water, corn syrup, soy oil, salt, guar gum, yeast, bicarbonates of soda, natural and artificial flavor. Cheddar Cheese Filling: cultured milk, cream, buttermilk, whey, sodium phosphates, salt, lactic acid, sorbic acid (preservative), vegetable color. Cheddar Cheese Topping: cultured milk, water, cream, sodium phosphates, salt, sorbic acid (preservative), vegetable color (annatto, paprika extract), enzymes). Contains: milk, wheat, and soybean.